It is the first day of spring, and Brandon, a Brookhaven College student, spends his day preparing for an upcoming showcase. He jitters anxiously around a room at school and files projects inside clear sheet protectors. He tries to keep his supplies organized, but when he opens his bag, he sometimes finds a toothbrush or shampoo. “I became homeless before I even knew it,” Brandon, who asked that his real name be withheld, said. In 2017, Brandon left his hometown in southeast Texas and moved to Dallas for a job offer he thought would advance his career. Upon realizing he needed a degree to get the job, he enrolled at Brookhaven and started working at a studio. According to a study by Temple University and the Wisconsin HOPE Lab, 12% of community college students nationwide were homeless in 2018. A 2016 study by the same found 11% of Dallas County Community College District students were homeless. “I considered couch surfing and bouncing around from friend to friend, but sometimes I wouldn’t have friends available, so I had to sleep in my car,” he said. On a typical day, Brandon wakes up on a friend’s couch or futon. He packs clothes and hygiene products in a gym bag and is off to start his day. He uses one bag of clothes for the week. 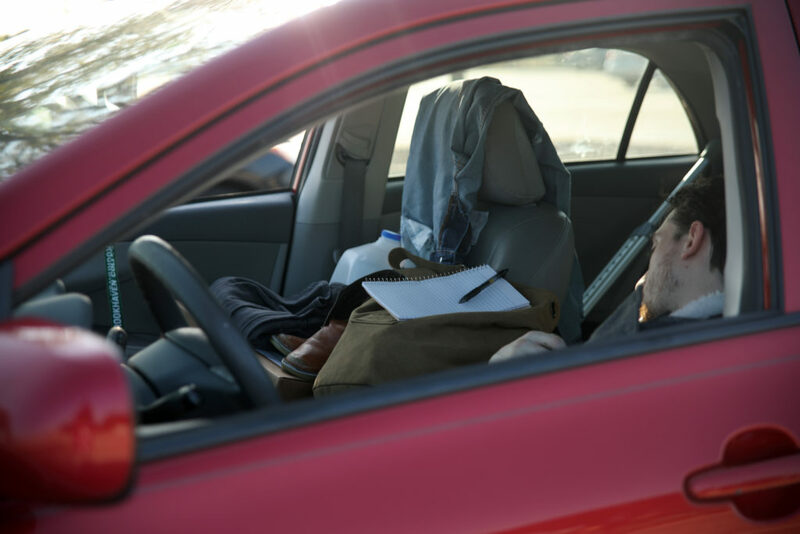 When he is not on campus or at work, he hangs out in his car or tries to keep himself busy. He has adapted to his living situation. Angela, a student who asked that her real name be withheld, now lives in her own apartment and juggles multiple jobs, including one on campus. In 2017, Angela and her mother moved in with a family member after they could no longer stay in their apartment. Angela said she left that home after a family member’s acquaintance tried to make a move on her and she was afraid she would be blamed. Avoiding going home created problems between Angela and her mother. So Angela packed her things and left. After leaving, she couch surfed four times and slept in her car once. Brookhaven provides food assistance for students, staff and faculty though The Cave, the campus food pantry, and the DCCCD Mobile Food Pantry. However, these options have not been helpful to Brandon. “I don’t always cook in the same kitchen. I can’t carry around groceries with me,” he said. Affording food was not a concern to Angela, who had enough money saved up to buy food. However, she did visit The Cave. Sara Goldrick-Rab, a professor of higher-education policy at Temple and the lead author of the student homelessness report, told NPR homeless college students devote as much time to the classroom and studying as any other college students. “However, [homeless students] also work more, they commute more, spend more time taking care of other people and they sleep less,” she said. For Brandon, it was important to go to school despite being homeless. “To me, it’s more like, ‘This is what I need to do, so I’ll do whatever it takes to do it.’” However, he said he has had to drop some courses. While Angela was homeless, she could not keep up with homework and talked to her professor to explain her situation. Recently, the Farmers Branch City Council unanimously voted to authorize a contract with Metrocrest Services. It is designed to provide help to homeless families with children by providing rental assistance, help toward self-sufficiency, workforce development, financial literacy and educational opportunities.